Ethiopia, Zone9: ቤተመንግስቱ ኃይለማርያምን የሚያሰራ ይሆን? የኢህአዴግ የኃይል አሰላለፍ ለውጥ አሳይቶ ይሆን? Thanks for this very insightful analysis and for putting things in perspective of the recent developments. Creating alliances through marriage, and thus keeping a finger on the button using ones spouse has been used as a strong political tool since the beginning of time. 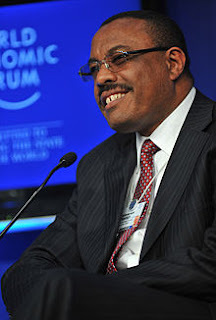 In this particular instance, please note that, W/o Roman, Ato Hailemariam's wife, happens to be from Tigray Region. She has been seen to wield some influence as a confidante, in the Ministry of Health of Ethiopia, where she works. Is that not a factor important enough to put into the equation?